The pharmaceutical products market in Argentina is projected to expand at a high CAGR during the forecast period due to government support and the increasing reliability of domestic players. Rest of Latin America, which includes Chile, Colombia, Ecuador, Peru, Paraguay, Uruguay, and Bolivia, is projected to witness the second fastest growth rate during the course of the forecast period. Factors such as a large patient pool and favorable government initiatives aimed at improving access to healthcare facilities are likely to propel the pharmaceutical products and CMO market in Rest of Latin America. Bayer AG, Novartis AG, Merck & Co., Inc., GSK plc, F. Hofmann La Roche, BASF SE, and Boehringer Ingelheim Group are some of the top players in the pharmaceutical products market in Latin America. Key participants in the CMO market in the region include Pisa Farmacéutica, Fresenius SE & Co. KGaA, Takeda Pharmaceutical Company Limited, Ferring Pharmaceuticals, and Inc., Landsteiner Scientific. This report on the pharmaceutical products and CMO market analyzes the current and future market scenario in Latin America. Most pharmaceutical companies are gradually outsourcing manufacturing activities to contract manufacturers in order to achieve efficiencies in cost, quality, capacity, and time to market or to obtain specific expertise in particular business category, which is not available in-house. Moreover, increasing cost pressures, cost benefits, and inclination of pharmaceutical companies to focus on core competencies such as R&D and marketing has created a need for pharmaceutical contract manufacturing outsourcing. The Latin America pharmaceutical products and CMO market report comprises an elaborate executive summary, which includes a market snapshot that provides information about various segments of the market. It also provides information and data analysis of the market with respect to the segments based on product type and countries. A detailed qualitative analysis of drivers and restraints of the market and opportunities has been provided in the market overview section. In addition, the section comprises Porters Five Forces Analysis for the CMO market in order to understand the competitive landscape in the market. This section of the report also provides market attractiveness analysis by country, thus presenting a thorough analysis of the overall competitive scenario in the pharmaceutical products and CMO market in Latin America. Based on product type, the market has been segmented into API and ingredients, finished dosage form (FDF), and pharmaceutical packaging. The market segments have been extensively analyzed based on available approved drugs, prevalence of the diseases, available patent of drugs, regulatory access, and geographical coverage in LATAM. The market size and forecast for each of these segments have been provided for the period from 2014 to 2024, along with their respective CAGRs for the forecast period from 2016 to 2024, considering 2015 as the base year. 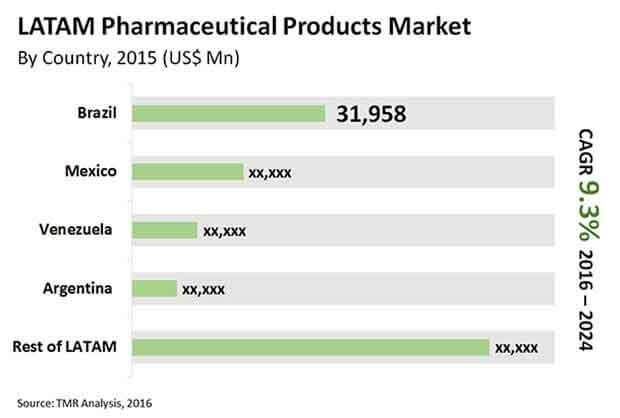 Geographically, the pharmaceutical products and CMO market in Latin America has been categorized into five major countries: Brazil, Mexico, Argentina, Venezuela, and Rest of Latin America. The market size and forecast for each of these countries have been provided for the period from 2014 to 2024, along with their respective CAGRs for the forecast period from 2016 to 2024, considering 2015 as the base year. The research study also covers the competitive scenario in these regions. The report also profiles major players in the pharmaceutical and CMO market in the region based on various attributes such as company overview, financial overview, product portfolio, business strategies, and recent developments. Major players profiled in this report include Bayer AG, Novartis AG, Merck & Co., Inc., GSK plc, F. Hofmann La Roche, BASF SE, Boehringer Ingelheim Group, Pisa Farmacéutica, Fresenius SE & Co. KGaA, Takeda Pharmaceutical Company Limited, Ferring Pharmaceuticals, and Inc., Landsteiner Scientific.